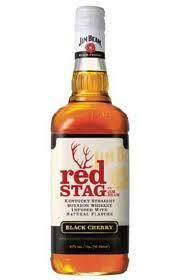 Maxxium UK has announced the launch of Red Stag by Jim Beam – a black cherry-infused bourbon which aims to recruit new drinkers into the bourbon category. Launched with the hope that it will “redefine bourbon and appeal to consumers both in and outside of the category”, Red Stag is aimed predominantly at 18-24 year-old professional males. Made with four-year-old Jim Beam bourbon, the product is also getting rolled out into European travel retail alongside the UK launch. Eileen Livingston, marketing controller for Red Stag, told the drinks business: “We feel this is the most exciting thing to happen to the bourbon category for years. “It’s no secret that many younger drinkers don’t really understand bourbon or it just simply doesn’t appeal to them, so we’re hoping to redefine their perceptions of what bourbon can be. “It’s meant to be extremely versatile, it can be a cocktail ingredient, a standalone shot or a simple mix with cola.